Racist response to Dallas shootings and the human desire to grieve the dead. Racist Responses to Tragedies Like Dallas Do More than Stoke Hatred. They Rob Us of Our Ability to Grieve. Gross, borderline incitement from the New York Post. The horrific attack Thursday night in Dallas, in which snipers murdered five police officers and wounded seven more, is the sort of American tragedy that has become all too common in our current Age of Arms. But if your first impulse was to grieve for these police officers, the response to their deaths made it much more difficult to do so. Thursday night’s shooting was followed, almost immediately, by heaps of racist online commentary, and then by blatantly bigoted and inflammatory news coverage. The killings thus served as a reminder of yet another way that our current political moment makes us a little less human: Whether the tragedy is in Orlando or Dallas, the overwhelmingly bigoted response to it from such a large chunk of our country has made it impossible to properly grieve anymore. One of the first sinister responses Thursday night, which appeared as news about the shootings was still arriving, came from former Illinois congressman Joe Walsh. This dolt, who has become known for inflammatory comments, let loose a series of tweets, including one (later deleted) that stated, “This is now war. Watch out Obama. Watch out Black Lives Matter punks. Real America is coming after you.” By the morning, things had gotten worse, and the vitriolic response had gone more mainstream. 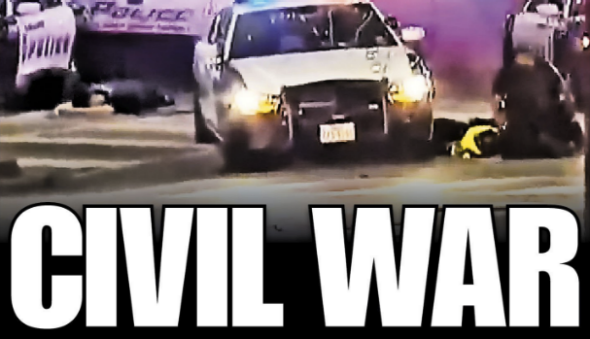 The Drudge Report, a highly-trafficked sewer of right-wing racism and hate, led its site with the despicable headline “Black Lives Kill.” The New York Post, normally a slightly less unseemly sewer of the same, decided to go with “Civil War” in its headline. As well as offering a clue as to what side the Murdoch empire would have taken in the actual Civil War, this form of gross, borderline incitement is legitimately scary and depressing. It is responses like these that now shape how people respond to tragedy. There was so much hatred and xenophobia circling the internet and the news media after Omar Mateen’s murder of 49 people in Orlando that the focus shifted nearly instantly from grieving the dead (and confronting the urgent question of how to stop men like Mateen) to Donald Trump and other preachers of hate. Indeed, Trump is, predictably, a huge part of the problem. All the jokes on social media about what bit of stupidity will trickle out from his mouth after every awful event merely underline the fact that one of our two major presidential candidates is very likely to respond to a tragedy with, at best, self-congratulations, at worst, bigotry and hatred. It is probably naïve to assume that there was ever a time in America (or anywhere else) in which one’s reaction to tragedy and violence could simply be grief and reflection. But the number of outwardly racist major right-wing media outlets that traffic in hate is, right now, unconscionably high. (Aside from Drudge and the Post, there are also Fox News, Breitbart, the Daily Caller, and many others.) And the heat those publications give off creates a welcoming environment online for racist commentary, both from waves of amateur hatemongers and from professional ones like Joe Walsh. None of these things make the killings in Dallas any less tragic or awful, but they do color our response to it. That, in itself, is enough to grieve over. See more of Slate’s coverage of the Dallas shooting.